Tom Hlenski is a longtime volunteer who instills the Red Cross mission in his family and serves as a role model for helping others who are suffering. Working alongside the Red Cross following the crash of TWA Flight 800 in 1996, Tom had a gut feeling he would join the Red Cross someday but it wasn’t until Hurricane Katrina that he first became a volunteer. With a doctorate in social work, Tom practices on Long Island and has dedicated much of his free time to the Red Cross for past 11 years. As a Disaster Mental Health volunteer, Tom utilizes his professional expertise to help others during deployments outside the region and right here in his own backyard. 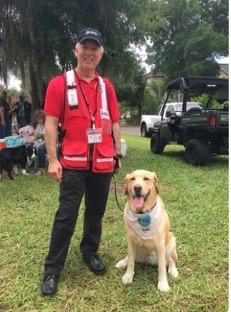 Following last Sunday's horrific shooting, Tom answered the call and traveled to Central Florida to support the Red Cross response. Thursday evening (coincidentally his birthday), we spoke to Tom about the power of comfort, support and togetherness amidst tragedy. What are you and the Red Cross doing to support Orlando? A number of us came to the Family Assistance Center to provide disaster mental health services. I worked the dog team in Buffalo [following 2009 plane crash] and had seen an opportunity where people get more relaxed with a dog and can begin to talk about their experience, their story, their narrative and what may have happened. Here, I’m embedded with a team from Therapy Dog International meaning they’ve accepted me as a partner. I recommend places I think would be good for them to visit where we would make contact with people who have been affected. These dogs are highly trained and highly vetted. Their calming effect has been incredible. It’s like the door opener. I see the how the whole mood of the place changes; it’s invigorating. More often than not it’s a very predictable narrative – “I just want to hug him” or “he’s just like my dog” – then they tell you about their dogs and show you pictures. That’s also the beginning of me talking to them. It’s such an easy way to get into that conversation of how they are impacted. So we make a visit and I do my disaster mental health work shaking hands, welcoming people, making assessments and determining if we need more disaster mental health people there. What other groups of people are you helping? In essence, the Red Cross helps anyone who has been touched by this tragedy. For example, the Family Assistance Center has attendants who greet you, some being security. They work day in and day out and feel a part of the stress the town is experiencing. Even though they’re remotely involved, they are a group we would ask about how they’re holding up. That gives an example of our reach and the different people we reach out to, not just those at the epicenter but also those on the borders. Within that framework, we are also talking to the workers and staff. When we visited the 911 call room, some of the workers were able to talk about their experiences (or not talk about them) but were able to cry, thank us for the visit and thank us for being there given it was such an emotional night for them. We look for who might be impacted so we can reach out to them. We tell them about the Red Cross – that we’re there and they can call us. We don’t provide long term therapy, but we can do assessments, have a conversation about resilience and make referrals if needed. How do you take care of yourself on such an emotionally charged deployment? I’m moving around. I’m mixing up locations so it’s not as intense, but it can be. Tomorrow I may be in a place that is extremely intense. So I drink my water, I try to rest, when I’m tired I sit down and I try not to push myself too hard. I have other disaster mental health people surrounding me so I talk to them and we talk to each other. That’s how we help each other. We share, we listen, we support, we hug. I also try to get a good night’s sleep. What does this response mean to you personally? Everyone can relate to how helpless they feel when something like this happens. Locally there are people who bake a lot and bring it to a site to feel like there is something they can do. It’s a horrible time when you feel so terribly helpless. I felt that helplessness and I knew I wanted to go [to Orlando]. I had known it was coming up for me and had talked to my wife about possibly deploying at the end of this year. She said she also wanted to go because she’s disaster mental health volunteer too and she supported that I wanted to go. I made a call to say I was ready and put my hat in there if they needed people to deploy. To be here at a time like is important for me. I can’t think of a better way to spend my birthday. I’m just happy to be here and happy to serve. Another thing that makes this so special is my wife is in the Red Cross, my daughter is in the Red Cross, my niece is in the Red Cross and my granddaughter is in the Red Cross. What my grandchildren see me, my wife and their mother do at the Red Cross is something else that feels great; they can see what we can do and what they can do.